Designed by Martin Majoor in 2004. 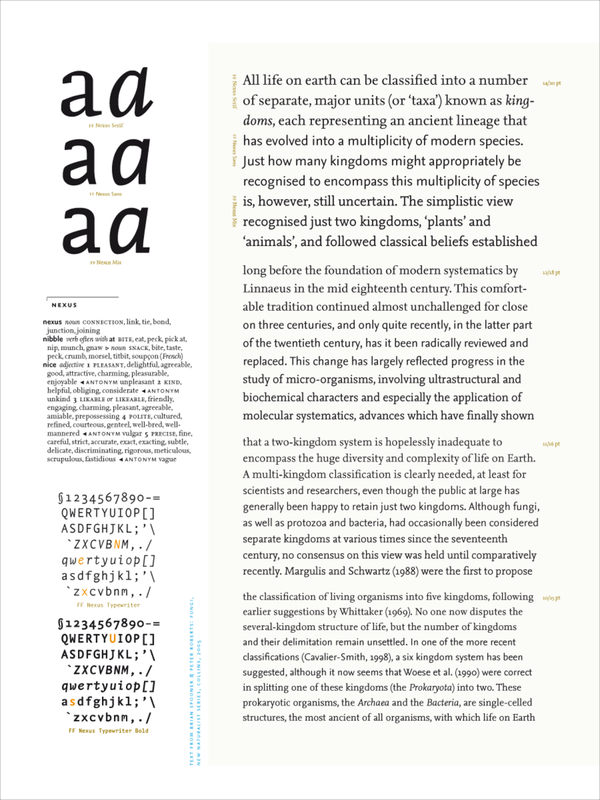 Published by FontFont as part of the FF Nexus Super Family. Swashin’ around with FF Nexus — “The happiest period in my type design life was when I worked on FF Nexus Serif Italic Swash.” As if FF Nexus itself with its 4 subfamilies wasn’t amazing enough, designer Martin Majoor made one of the styles stand out even more; FF Nexus Serif Italic now comes with two additional swash alphabets, which we incorporated in a sophisticated way. In this screencast, FontFont technician Christoph Koeberlin demonstrates how to get access to them. FF Nexus Serif supports up to 82 different languages such as Spanish, English, Portuguese, German, French, Turkish, Italian, Polish, Kurdish (Latin), Azerbaijani (Latin), Romanian, Dutch, Hungarian, Kazakh (Latin), Serbian (Latin), Czech, Swedish, Belarusian (Latin), Croatian, Finnish, Slovak, Danish, Lithuanian, Latvian, Slovenian, Irish, Estonian, Basque, Icelandic, and Luxembourgian in Latin and other scripts. As Martin Majoor designed FF Scala and FF Scala Sans in the years between 1988 and 1994, the driving idea was to design a humanist serif from which a sans would be derived. In Majoor’s words: two typefaces, one form principle. 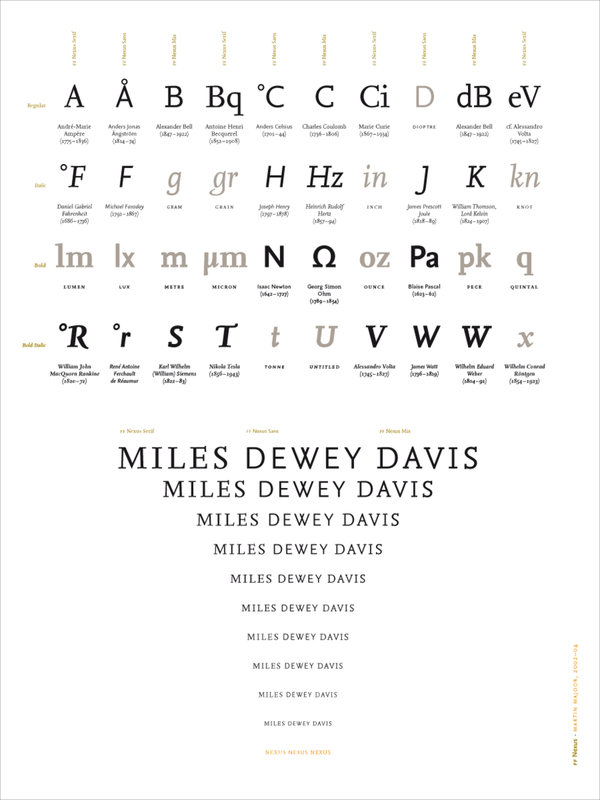 The concept became the basis upon which his type design philosophy stood. Since the release of FF Scala’s companion sans, the combination of serif and sans in a single type family has grown to become popular and highly successful in corporate, book, and newspaper design. 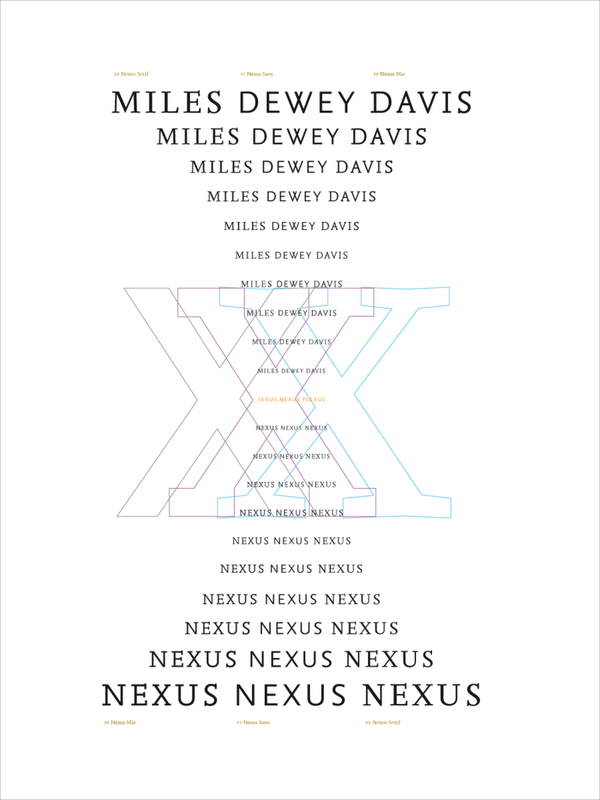 Ten years after first testing his idea of “two typefaces, one form principle,” he ventured into a new phase: “three typefaces, one form principle,” creating a superfamily as a result: FF Nexus. A popular and strong performer in the FontFont Library, FF Nexus takes some of its structure from FF Scala, adding a slab-like FF Nexus Mix and the monospaced FF Nexus Typewriter to the series.“Even though my first typeface, FF Scala, is still more popular, FF Nexus is, in my opinion, the best typeface I have created so far,” says Majoor. “With FF Nexus Mix, I introduced a third family member in my type design philosophy, and I am happy that this slab version is not a stand-alone typeface; it feels best when accompanied by serif and sans.” While working on the FF Nexus Web FontFonts, the FontFont Type Department decided to revisit the OpenType features of its print fonts as well. 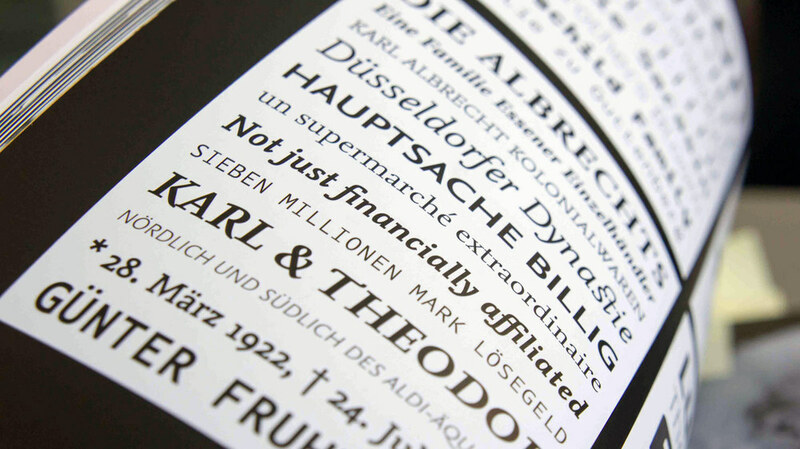 In 2006, Martin Majoor’s FF Nexus Serif won first prize at the Creative Review Type Design Awards held in London, in the category of Text Families. Check also the FF Nexus superfamily with 3 more Families.